Do you want to copy files faster on your computer or laptop? Well, check this list of the best fast file copy software for faster transfer speeds. 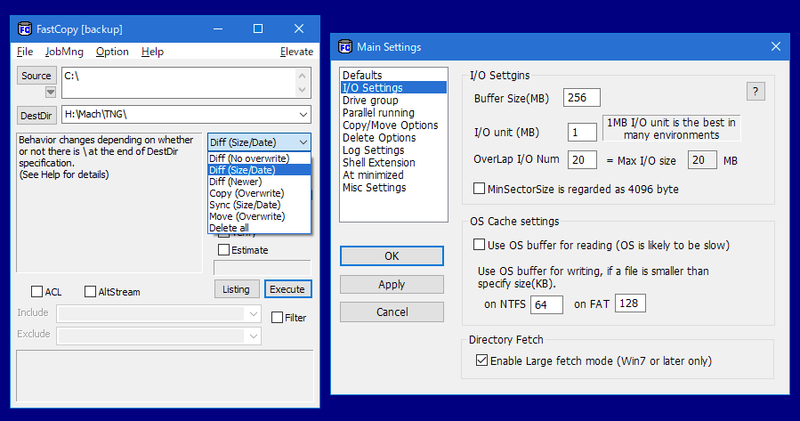 When dealing with files and folders in Windows, as a rule, you use File Explorer integrated into the operating system itself, but the truth is that you can also draw on other apps developed by third parties for these tasks. In this way, you can increase the functions offered by the File Explorer mentioned above to optimize this type of work so common for years. At the same time, among some of the advantages that we will obtain when dealing with this personal information, is to gain in process speed when copying or to move files, in addition to adding some features to which you are not too accustomed, and that can be useful. So let’s see the best fast file copy software for Windows. TeraCopy is a fast file copy software to copy and move files in Windows in a much more powerful way than the one that comes with the system. Its most significant assets are that in theory copy much faster than if you do with Windows Explorer, you can pause and resume copying files at any time. In case there are errors will continue trying to copy and if it finally fails to show a list with the erroneous files so that you can solve it, integration in the system (supplanting if you want to the current copy/move) and support for Unicode. It also has a professional version that includes specific improvements, although I believe that the free version will give you everything we need from a tool of this type. Nice Copier is a fast file copy software that replaces the traditional system of copying, moving and pasting files or folders with a more complete and improved one. As shown in the images the old windows window is replaced by this one which has pause, resume and cancellation buttons in case you want to modify the action. Apart from this, Nice Copier shows a more accurate time than the one indicated by Windows. In this way, we can know almost precisely when the action will be completed. For its installation, it is necessary to execute the executable file with the administrator rights. Once executed, you will go to the menu bar of windows, where with the right button of the mouse you will click on the new icon corresponding to the Nice Copier program, and you will click this time already with the radio button on Install ShellExtension. Once this is done, you will have installed your new system to move, copy or paste files or folders. In the case that you don’t like how it works and you want to uninstall it, you only have to do the same thing except for this time by clicking on Uninstall ShellExtension. Fastcopy brings a large number of advantages over the standard Windows copy function. These improvements are especially evident when we have to copy a large amount of information from one device to another. First, Fastcopy is substantially faster. The speed of copy approaches the real limit, fixed by the speed of the devices (logically, this would be the maximum possible speed). This is a significant improvement over the copy function of Windows. On the other hand, it allows adjusting the speed at any time during the copying process, decreasing or decreasing it according to the load needs. You can even pause a copy task altogether, in case you are reducing the performance of the system too much, and then resume it. Besides, Fastcopy adds the ability to continue a task in the event of a failure during the copying process, for example, because a USB device has been accidentally disconnected or a network drive is temporarily unavailable. On the other hand, it provides a queue of pending tasks. Copying files from multiple locations are prohibitive in Windows because the process slows down exponentially with each new simultaneous process. Fastcopy automatically adds the jobs to your task list and executes them sequentially as they finish. Finally, the estimate of the remaining time is much better than that provided by the Windows copy function, which has never stood out as being particularly accurate. The option to show the remaining time is deactivated by default, but it can be selected in the program options. Fastcopy is integrated with the Windows context menu, so it can be started by right-clicking on any file or folder. The options for integration with the system can be controlled from the options menu. Undoubtedly one of the best fast file copy software for Windows. KillCopy is a fast file copy software that will allow you to copy and move your files faster in Windows. Also adds a new tool such as the secure and definitive deletion of files. For this last one you have also seen a few utilities, such as Wipe File, Freeraser or Microsoft SDelete, but the good thing about KillCopy is that instead of using several tools you put everything together in one app. KillCopy allows a wide variety of configuration options, which makes it ideal for advanced users who will be able to test them all on their systems and determine the best for them because you all know that with so many possibilities of computer configuration, options that maybe respond well in one computer do not do in another. 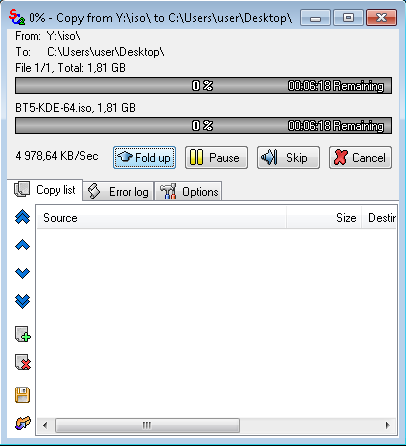 KillCopy is a freeware tool, compatible with all versions of Windows and also tiny since it occupies just 585 KB of space. Anyone who has ever copied large amounts of information in Windows from one folder to another or from one disk to another will know that it is more dangerous than leaving some matches in the hands of some children. The possibility of stopping the copy is more significant than not stopping, and I speak from the experience of having to repeat the process more than once moving GB of information. The issue is that if there is another person or app are using an error such as one of the files that we are copying causes the complete copy to stop suddenly, for example. Thanks to fast file copy software like Ultracopier you can be confident. With Ultracopier you can copy and paste between different locations and at all times control what is being done. If at some point you want to pause the copy you can do it, and you can even skip a file. In addition to any problem, such as a duplicate file will ask you what you want to do. Once the copy is finished you can access a log where you can see all the errors that have occurred (if that is the case) and thus be able to locate files that have given a problem if you want to copy them one by one manually. No doubt an essential tool as Windows works. RichCopy is a small, fast file copy software for Windows that comes from the same Microsoft, and that will allow you to copy and move files in a much more powerful and with many options. What RichCopy will allow you is to copy and move files from different folders to one, which should only be selected from all their locations, and everything is done in a single process with progress bars, which you can monitor at all times. The advantage of RichCopy is that of copying multiple files in parallel instead of doing it sequentially, which significantly speeds up the task. 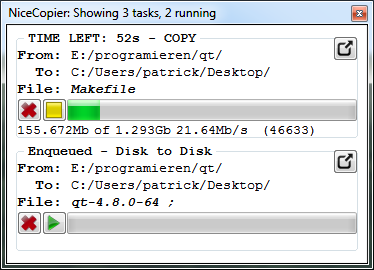 And the difference in speed becomes more noticeable as we increase the size of the copy and this exceeds 5 GB. Besides, of course, RichCopy offers us other improvements, such as the ability to pause and restart the copy process. Many times when you want to copy hefty files, you notice that although we have a potent computer, it takes a considerable time the process. That is why if you’re going to speed up the copy and transfer of files in Windows you need SuperCopier. SuperCopier is a fast file copy software that occupies only 2Mb and will entirely replace the Windows copy tool by default, obviously, provided that these operations have been started in the Windows Explorer. Also if you wish you can pause a copy of files to resume the task later when you consider it appropriate. The best thing of all is that if you want to transfer large files such as videos, music or movies among others, for example, a USB memory you will notice a performance increase of approximately 15%. If we want to transfer 5 Gigabytes, the operation will be 15% faster than in the traditional way (with the copy utility that is included in Windows). One of the most used features within any operating system is to move and copy files between different folders or devices. And ExtremeCopy brings added value to the dialogs and performance that come by default in Windows. As you can read on its website, it will accelerate the processes of copying files between 20% and 120% concerning performance using the tool that comes with Windows. Besides, it is compatible with all versions of Windows from XP and indeed incorporates a 64-bit version. This fast file copy software weights 2.1 MB file and the installation is quite fast. Once these steps are completed, you no longer need to configure anything else. The next time you copy a file, a different dialog will appear that the one that emerged with Windows. Two buttons appear that will allow you to pause and resume a process of copying files at your will. Functionality that is interesting when, for example, you are making several movements on a device, and you want to prioritize one of these transfers concerning the others. Next, to it, the second skip button will allow you to skip the copy of the current file. 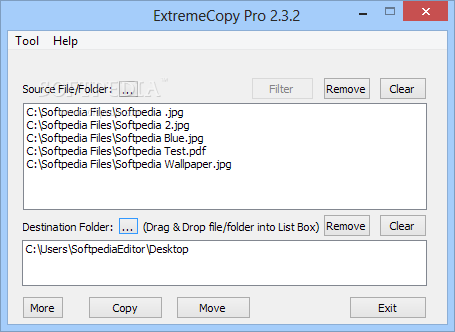 And here is one of the best features of ExtremeCopy. When an error occurs in the copy of the file, the transfer of all the files that were left to be copied is not canceled, but it informs you of the error, asks you what to do, and you can continue with the copy knowing what the file that failed was. On their website, they surprise you with figures of between 20% and 120% more in copy processes concerning the Windows utility. That something works one hundred percent faster than something else implies that it is twice as fast. Do you appreciate that much difference? But with the clock in hand and looking at the file transfer rate if those differences are observed. Especially when you are faced with copying large files, from 300 or 500 megabytes, we do see an improvement in performance, which in some tests has reached 70%. So far those were the best fast file copy software to transfer files faster and efficiently. These tools are useful when you want to transfer large files because it will prevent you for some errors that can occur and save you a lot of time. Do you use other software? Let me know in the comments section.